12/2014 Update: I keep planning to take some pics of the “screw thing” to post with this, but keep forgetting. Sorry about that. 11/2015 Update: This is the most viewed article on my site. Who knew there were so many folks out there with bad Furbys! 12/2016 Update: A year later, and folks are still finding this article. There were about 300 views of it on Christmas day. Retro presents, I guess? If your old Furby won’t wake up or won’t start up and appears dead, you may be able to fix it in a few seconds without having to take it apart. I suspected you could just get to the motor using a small screwdriver and going in around the eye or beak, and indeed, it works. I was able to use a tiny flathead screwdriver, inserted above the beak and in to the left to gently rotate the corkscrew spiral connected to the motor a few times and within seconds, the Furby was alive again. Both units were fixed this easy, with no disassembly required. Update: Thanks to Samuel (http://twitter.com/samsearight), we now have a photo. On my Furby, there is a corkscrew spiral gear I moved, and not this normal gear. I don’t know if the gear is also in mine or if this is a different revision. It looks easier to work with than the gear I found in mine. Thanks, Samuel! This entry was posted in Furby on January 7, 2013 by allenhuffman. I’d been meaning to post a tutorial to that instructibles site but haven’t had time to touch it since then. One day, hopefully. Hey bud. Do you have any other info on how to spin the actual motor? did you just shove it to the left of the mouth? or Above the mouth and in? I used a small flathead screwdriver, and just stuck it in to a grove of the spiral and gave is some gentle pressure until it budged. I pushed the top beak down, and went in above the beak. Thanks! I bought my kids some old in-the-box Furbies today and everyone was sad when they wouldn’t work. Your suggestion worked perfectly. My furby is overheating now! NEED HELP!! One of the original 1998 models? There isn’t much in them except a motor. What happens? Tried this today and it worked like a charm! Thank you! I am glad it worked! I have been meaning to post a video tutorial on how to do this, but keep forgetting. Please, please post a video – I bought 4 for my granddaughters for Christmas, and I can’t seem find the spiral gear! I can flip the beak down, but still don’t know what I’m looking for. Thank you! Best advice ever! Super easy fix without having to take it apart. Thank you. My daughter is super happy! This worked! Thank you so much. I got my wife a 1999 furby for Christmas and it wouldn’t do anything, but I was able to pull the beak down to unclip it to allow me to pear in with a flashlight and found the corkscrew gear on the left. A small spin to this gear got it going! So glad I didn’t have to do the surgery. Thanks again! just found my old furby and put batteries in it for the first time in 15 years. did this little trick but I used a small drill bit and it came right to life. OMG! We just tried the ‘trick’ on our 1998 Furby and it worked! I’m so excited! Thanks!!! I am so glad this is useful to folks. I should eventually get around to making a short video demonstration of it. your awesome my mom just picked up a furby brand new in a box at a yard sale we tried to bring it to life the normal way but nothing he was dead. I didn’t have a screw driver handy so I used a metal small nail file and it worked !!!! thank you so much my daughter now has a new friend thanks to your post. I personally don’t have faith in myself to take something like this apart. Thank you for the note! I am glad it helped someone else, as well! You’ ve made my son very happy and made me look like a hero. Thank you. I get home from work and troubleshoot a 16 year old Furby. Welcome to parenthood. IT WORDED I LOVE U!!!!!!!!!!!!!! I did it with my 1998 furby but now he dont stop moving, he is going crazy, wont talk, etc, does anyone now what to do? Heck yeah! It worked just like you said! Thank you for posting this. Found a 1998 Furby at a thrift store and using this trick made it work again. You rock! I just bought an original mint in box Furby off of Ebay. Was super disappointed that it wouldn’t work. I tried different kinds of batteries and as I was about to give up, found this post! IT WORKED! Thank you so much for sharing the Furby reboot secret! Awesome. I am so glad I posted those notes there when I went thru the same thing with my original Furby. Okay so I was also having trouble finding the corkscrew spiral. It is white and plastic. As mentioned. Go through the top of the beak, to the left and down a bit. I totally looked past it several times. I couldn’t tell if it was moving easily so I just got the screwdriver in one of the grooves and just put pressure on it. It’s almost impossible to see what you are doing but I started to hear it grinding and making some noises and eventually it just came to life. Hope that helps some of you!!! It’s so thin at the top of the beak and I can’t pull it down. What tool is everyone using? I used a small flat head electronics screwdriver (from the kit Radio Shack sells) — like a larger version of the ones you would use on glasses. I just push it with my finger, though my eyesight has gotten worse since I first did it so I can’t see the coil until I get my glasses updated 🙂 I will try to post a photo soon, but on the first gen units you can push the top beak down and a gap opens between the top of the beak and the top of the unit. Just be careful, as there are some small parts where it pivots in there. I’m at this stage but I can’t seem to turn the spiral, the screwdriver keeps slipping and I can’t fit my finger. Any other ideas? I have tried this but my Furbie is still dead 🙁 any other ideas? All way around !!! Still nothing ? You are the best it worked like a charm. I bought it new from ebay and it came broken. Followed your advise and now it is singing, burping and sneezing like it was new. I got a Furby at a thrift store. It had corroded batteries and I cleaned the case out and put in fresh ones. Still dead. Tried your suggestion, and it did wake him!. However, he has no audio. How can I tell a “no like” from a “yum?” 🙁 He moves, ears go up and down, eyes open and shut, he rocks, but no voice. I don’t even know his name. Very sad. Any suggestions welcome. I used tweezers to grip the spiral and it worked, i think i turned it to toward the right. Yes this worked!! If you put your thumb on the top beak and pull downwards the beak comes off the hinge and you can easily see the white gear motor under the left eye as mentioned. After moving the gear 3-6 times downward the furby started to make a tiny growling sound! A few seconds later boom alive again. Simply genly push the top beak and it will snap on the hinges again. I woke my Furby by pushing on his tongue and shaking him. None of the suggestions above worked. I did some more research online and found this suggestion to push on the tongue and shake shake shake. Thanks so much!!! Thrift shop find of 1999 Furby Baby, with box..$1! Corroded batteries….replaced them. Nothing. Found your post and gave it a whirl. Took a few tries. But I got it!!! Push beak gently, while looking at it, on the left side take a small flathead screwdriver and push gently. Took a few pushes and then the gears started turning and baby talked! All my stuff is packed away right now, but maybe someone else who has done this successfully can send one in and I can post it. Forget the screwdriver, tweezers and anything finicky. My son just got a 1998 Furby at a Comi-con and the Furry-*&^% thing didn’t work. When all else fails…another way to get the screw moving is to give a GOOD shake (I’ve done this before, he has two other ones); shake once, shake twice and then shake it like it gonna die! Wait, it lives! I can’t believe how easy that was! Thanks for the awesome tip! My 3 year old is now playing with the furby I got for Christmas 18 years ago! You have my sympathy 😉 Did they EVER give these things a power off switch? I had some in the back of my car and hit a bump and they all woke up and chattered away the rest of the drive. Just tried this method on a new in box and never used 1999 Furby. Worked like a charm! Tho I had put new batteries in it a week prior and I think the week of possibly trying to run the motor drained them. It did come to life after moving the worm gear but acted very odd. Weird sounds, not words, simple motions etc. I put in new batteries after moving the gear and it jumped to life talking up to storm. then went to sleep. Very happy with such a simple fix ! Thanks for the report! This article has been getting a bunch of views this past week. I wonder if old Furbys have been making the list as a restro Christmas gift or something. Posted! Thank you so much. On mine, I found a spiral corkscrew type gear. Do you see that too? Moving that gear you pointed out looks easier. My curvy doesn’t stop running…. as in the mouth opens and closes, eyes blink, ears move, motor is loud and emits a foul odor. Suggestions? My furby just kept going to sleep. I tried going in through the beak and was able to move the gear around many times and it didn’t work. Then I tried holding down it’s tongue while shaking it really hard and he woke right up and is working like new now!!!! We had the corkscrew one too. Your tutorial worked! Thank you!!!! I moved the white spiral mechanism to the left. My Furby made a mechanical noise, then nothing 😩 HELP pleeeease! I did this on a Furby and a Furby Baby and it worked except I think both speakers need to be replaced. I pulled the top of the beak down off of the hinge and both of them had the corkscrew thing. It was further towards the back than I would have thought. I used a bobby pin and just kept pressing down on the corkscrew. After a few more pushes following a pathetic grumble or 2 they both started working. Now to skin them and check the speakers…..sigh! Thank you for posting this! It worked!! I gifted my kids a piece of my childhood! And I thought for sure Christmas was ruined when 2 of the 3 didn’t work! However I looked at this forum and they r alive!! Yay!! Thank y’all soo much for posting this! Thank you very much for your post, it worked perfectly on my wife’s 1999 Furby. Just a heads gentle push with a small Flathead screwdriver on the white corkscrew gear on the top left corner behind the beak. Amazing! Thanks again from Buenos Aires, Argentina​! Wow, those Furbys got around. I didn’t know Furbish was international. Do you need to rotate th corkscrew left or right? I don’t think it matters. It is just about getting it moving a bit to unstick it. Allen, I’m so glad you’re still looking at this post! I got my 1998 Furby to wake up now, but he has no voice. Any ideas? That’s not an issue I’ve encountered, but if it moves without voice, it could be as simple as a wire coming loose from a speaker inside. I don’t know the technical details of the “brains” of the Furby to know for sure, though. I need to try this. Thank you ! Hi, I have another Furby which is working fine, but squeaks intermittently (usually while falling asleep). I considered using oil, but don’t want to hurt Furby. Any suggestions? Thanks! I really and truly want to thank you for this tip! I thought I was going to have to dissemble my furby! Wow, it took me over an hour,and trying several different implements…small flat head screwdriver, paper clip, smallest drill bit in the box, applied a little pressure on the white plastic piece inside above the beak to the left and finally it worked. Thanks for keeping this post around! Have been having so much fun with our old Furby since your ‘fix’ worked ! Thank you again! So my mom had an original 1998 Furby still new in box and wanted to give it to my 2 year old son (her grandson) for Christmas but when we tested it it was dead even tho it has never been played with or had batteries in it. Found out they die from just sitting. After quite a bit of searching I found this site and it did the trick. Thank u so much. My mom is so happy and now my son will be as well Christmas morning. Ordered a furby on eBay and didn’t work. Tried this trick and it works! Thank you! 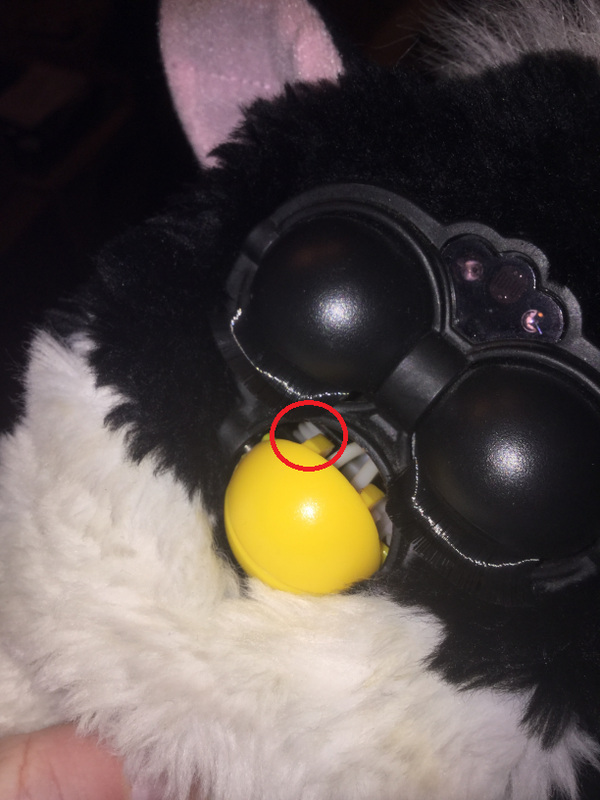 Bought a furby about a month ago off of ebay and it didnt work, i want to try this method but the top bit of the beak doesnt pull down like that? im a little scared to use too much force in fear of breaking it, any suggestions? I only had the original version, so if they changed the beak mechanism I don’t know about it. I really need to dig mine out to get photos or a video. It might be the same as yours, but my instructions aren’t real clear. What if the Furby was never used and the beak is open? Is there a way to close it? Does it power up? The Furby was a very clever design. It used one motor, and some kind of fancy set of gears that would open/close the eyes and the mouth, as well as do the tilt, based on where it rotated. It let them do several animations with just one motor. If it’s stuck open, the gear is probably in that position, and it should rotate back to a “home” position (mouth closed) if it still runs.